Someone has suggested that Easter in our materialistic world is something of a “cosmic Freudian slip.” In a world totally dedicated to the stuff of the here-and-now, the hereafter somehow sneaks in and makes itself known at Easter time. 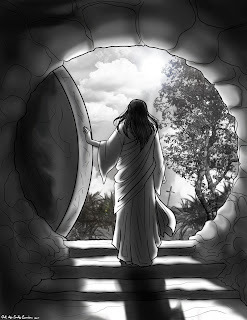 Because this traditional holiday is traditionally connected to the story of the resurrection, people will pause amid the bunnies, baskets and bonnets to ponder the story... and for a moment, the possibility of eternity sneaks in. And that is a good thing. Or is it? Why is it that singing “Joy to the World” and “Hark! The Herald Angels Sing” somehow seems out of place at any other time of the year except Christmas? It's because we have so connected the story of the birth of Jesus to the holiday of Christmas that the holiday is the only time that we think much about it? I wonder if we do the same thing with Easter? Is the resurrection such a traditional Easter message that we think about it only during the Easter season? I did a very quick look back through some of my old sermons (spending too much time doing that is depressing). From what I could tell, about half of the sermons I have preached on the topic of the resurrection have been around Easter time. That sort of makes sense— I know I'm preaching an Easter-theme sermon, so I save the resurrection-texts for that time of year. So has resurrection become a seasonal message? I hope not. In the New Testament, the power of the resurrection is a daily spiritual force in the life of the Christian. The resurrection isn't just a historical fact for us to believe; it is the in-breaking of God into our lives. Paul talks about the new life we have through the resurrection (Rom 6:4). We're raised to live above sin in this resurrection power (1 Cor 6:14-15) that is at work within us (Eph 1:18-20). It was that resurrection power that Paul wanted through knowing Christ (Phil 3:9-10). The power of the resurrection is not just a comforting message for us as we contemplate death in the future; it is the power of God in us for in LIFE in our present. This story that we read yesterday and today as we closed our reading John's gospel is not just God reminding us that He can raise the dead. He is also reminding us that He has power over the train wreck of our lives to raise us to live this life anew. That’s why the story of the resurrection is of first importance (1 Cor 15:3-4). It makes all the difference in the world.